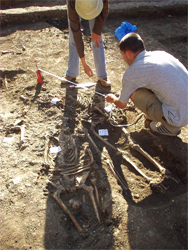 I’ll venture a guess: by 2010, Sibiu will be the focal point of tourist activity in Romania. Why? Because it will offer a unique mix of cultural activities in an attractive, inviting and well protected medieval setting cocooned by the communist-era. It is centered, too, on a Transylvanian region of natural beauty bridging the four dominant national cultures: Romanian, ‘Saxon,’ Hungarian/Szekler, and Romani. Though depleted of its 700 year-old ‘Saxon’ populace during recent decades, Sibiu is testimony to Romania’s quickening evolution. Designated “European Cultural Capital for 2007“, the city (more) is twinned with Luxembourg for this high-visibility event. The latter is more than a chance pairing. 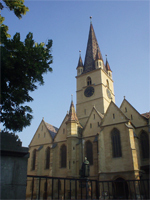 Settlers to Transylvania in the 13th century and later originated from the Luxembourg region. 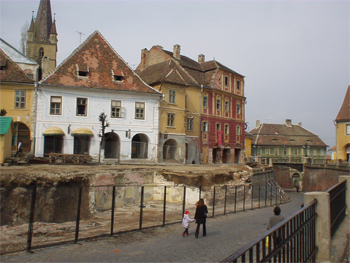 Tangible changes in Sibiu are dramatic. 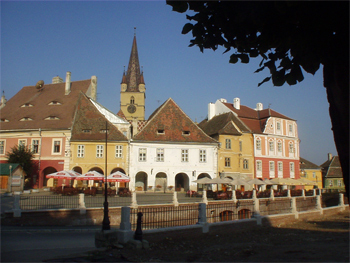 The writer has visited Sibiu over a 40 year period and more frequently in the last four years. In the most recent three year period, spanning the first and second mayoralty terms of Klaus Johannis, public and private works have proliferated in the medieval old town as have recent industrial investments by blue chip manufacturing companies in the periphery. Siemens is the latest to announce a major plant location in Sibiu. The result of all this bustling activity is full-employment. Perhaps most dramatic is the sudden metamorphosis of this small city into a mini-tourist heaven. Much of the restoration and planning has been stimulated by the German government through programs managed by its GTZ organization. The current centerpiece is the rejuvenated Piata Mica (see photos) and its suddently popular outdoor cafes and cellar winebar-cafes. Next on the work list is the adjacent Piata Mare dominated by the work-in-process renovation of the City Hall alongside the Brukenthal Museum (more). 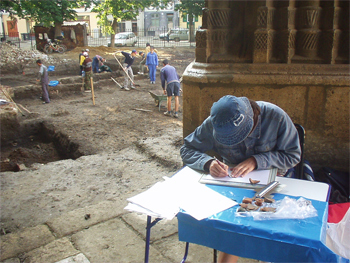 The 14th-15th century Evangelical Cathedral and its 6000-pipe organ is being spruced up, a process that led to the unexpected discovery of a forgotten 500-1000 person cemetery along its sides (see photos). Earlier in the year the Thalia Theatre (see) opened as a small, elegant home to the Sibiu Philarmonic Orchestra. This year, too, marks the 100th anniversary of the ASTRA Ethnographic Museum (more) a world-class museum that grew to maturity under the guidance of Prof. Corneliu Bucur. Unique for its extensive collection of traditional work instruments that are still manned, the museum is widely recognized for excelling in its programmatic work. The Museum’s ASTRA Film Festival, headed by Dumitru Budrala, already attracts world attention for its focus on ethnographic and anthropoligal documentary films. There is every reason to believe that culture and nature-minded tourists will soon discover this hospitable medieval haven and its surroundings attractions.